After a long journey we arrived in Nyundo, almost one and a half hour bumpy roads until we finally arrive in the forest of Gushwati. During the journey you cannot miss the tea plantations, the pride of the region and if you believe the bill boards, the best tea in whole Rwanda! This morning we meet up with Charles and Martin, two Rwandans. They are our guides for the next 2 days. They know the Gishwali forest like the back of their hands, as Charles told us, who lived there until 1985 with her family under a green leaf roof. Since then she has been forced to live in villages because their native home areas in the forest have been out of bounds because they have been given a sacred status. We were curious. Does the knowledge of mushrooms make a part of their collective cultural memories? Do they still eat these mushrooms? Do they have their own local names for these mushrooms? It’s up to us to see what we can find out during our mission. According to our guides they are named ‘ Ikinyagutwi’ in Kinyarwanda. Both of them know these species very well, but, surprisingly they don’t eat them so much which is striking since they are considered elsewhere in Africa as a delicacy. We quickly make some photos, take some samples and continue on our way. Using machetes our guides cut a path through the thick undergrowth. A little further on another find the mushroom Agaricus cf. bingensis. 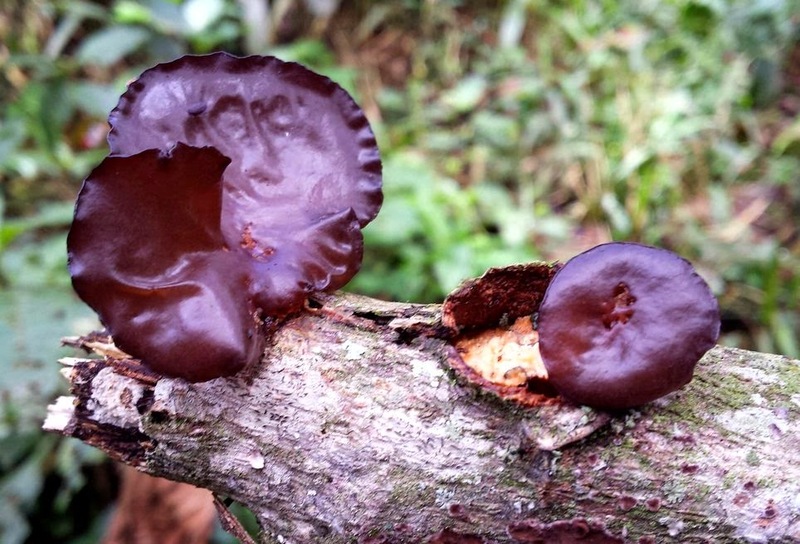 In Uganda this relative of the 'champignon de Paris' is highly appreciated as a culinary delicacy. Not here though. Local tradition has it that you will become deaf if you eat it! The local name leaves no doubt over. ‘Ikizibamatwi’ means ‘mouth’ on the ear! Continuing on our journey we find around 20 other edible species that are collectively known as ‘Ubuzuruzuru’. Possibly a generic name that indicates that they are edible. 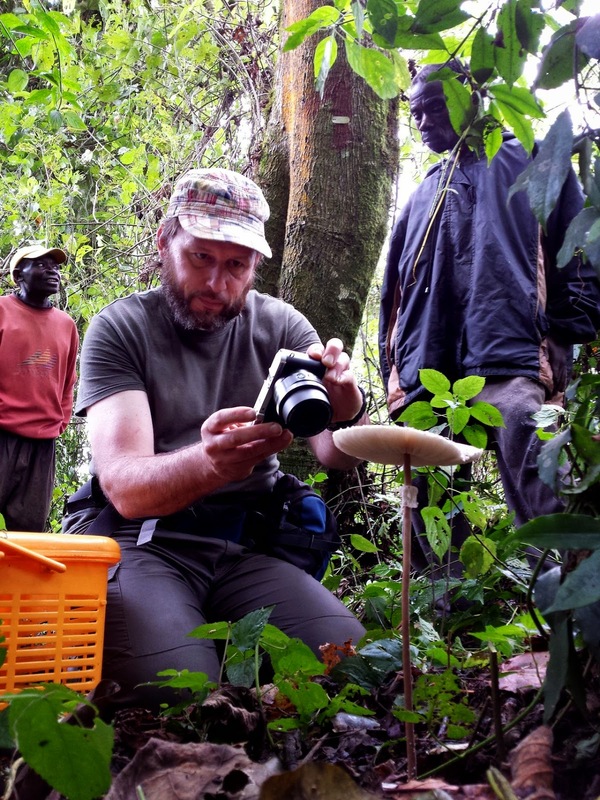 Amongst our finds an oyster mushroom (Pleurotus djamor), an interesting find with potential for Kigali farms. Although Charles and Martin have a considerable knowledge of native forest mushrooms, the same cannot be said for the younger generations who have never know life in the forest. Unless we do something now, all of this local knowledge will be lost forever. 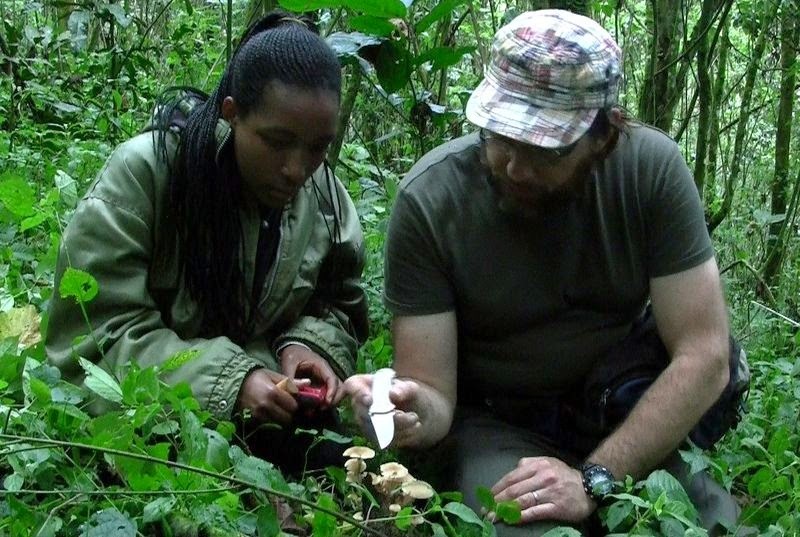 It’s for this reason that local mycology is such an important part of our mission here in Rwanda and it underlines the commitment of the Botanic Garden, Meise to contribute, in a positive way, to keep this knowledge from being lost forever. If we succeed, the future prospects for the local people will be improved giving them a sustainable means to improve their nutrition and their lives. The potential for eco-tourism should also not be underestimated as an additional source of income.